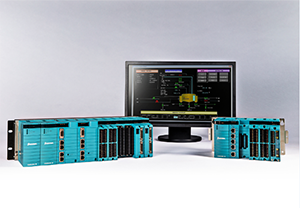 We have developed the FCN-RTU low-power autonomous controller for oil and gas wellheads. FCN-RTU is based on the core technology of the FCN (Field Control Node)/FCJ (Field Control Junction) autonomous controller, and offers low power consumption and improved environmental resistance. With these functions, FCN-RTU can operate with solar power and under harsh conditions while retaining the same high reliability as STARDOM FCN/FCJ, thus satisfying the needs for oil and gas wellheads. This paper outlines FCN-RTU and describes its technical features such as operating specifications (-40 °C to 70 °C, altitude of 3000 m), low power consumption, and high reliability, and its applications. Yokogawa Electric Asia Pte. Ltd.
Due to the rising energy demand in emerging countries in recent years, the amount of oil and gas production has been increasing, thus investment in the development of new oil and gas fields and replacement of old facilities has been booming. Oil and gas mining sites are widely scattered over areas where environmental conditions are harsh, for example, very high or low temperature, high altitude, or underdeveloped power and communication infrastructure. The controllers used in these mining sites require the following functions and capabilities. The STARDOM network-based control system provides openness, easy engineering, high reliability, and long-term operation capability. With this system, we have been offering solutions suitable for the new energy market, and now, in order to strengthen our solutions for the oil and gas mining market, we have developed the Field Control Node-Remote Terminal Unit (FCN-RTU), a low-power, high-reliability controller, enhancing the STARDOM lineup. 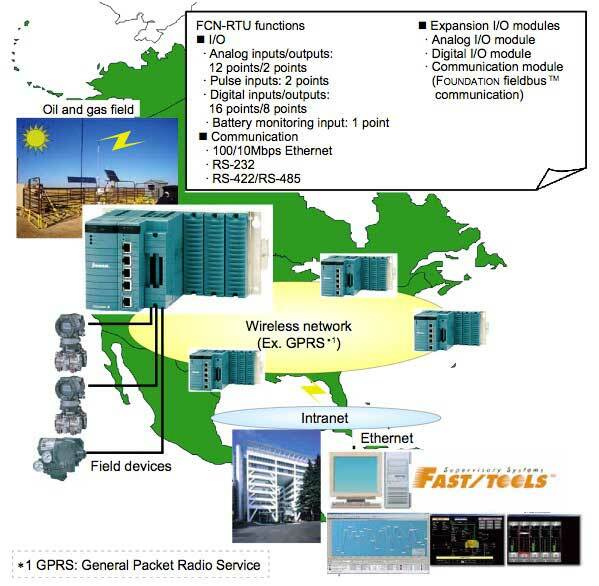 FCN-RTU has many features that competitors' products do not provide. It offers high reliability with the error-correcting code (ECC) function, which is a feature of STARDOM, supports field digital communication, and offers a new power-saving function for the CPU and a communication function. This paper outlines FCN-RTU, describes its technological features in terms of both hardware and software, and introduces an application example. Configuration and overview FCN-RTU is based on the core technology and the hardware structure of the Field Control Node (FCN) autonomous controller for STARDOM1, and has various functions required for controlling, operating, and monitoring facilities for oil and gas mining, which are compactly incorporated in its structure. Figure 1 shows the external view of FCN-RTU. As shown in Figure 1, FCN-RTU consists of a CPU module, a power supply module and a base module. The CPU module and power supply module are mounted on the base module, which has three empty slots for I/O module expansion. The CPU module has an MPU executing control computation, and provides built-in functions for analog and digital I/O and pulse input, thus covering the functions required for usual oil and gas mining sites, without I/O expansion. The I/O modules that can be inserted in the I/O slots for expansion are the same as the existing FCN I/O modules, thus various I/O modules can be used to complement the I/O functions in the CPU module. As stated above, compared with competitors' products, FCN-RTU can be used with its minimum configuration but also allows future I/O enhancement. The controllers installed in oil and gas mining sites usually require the following operating conditions: power consumption of up to 3 W for a total controller assuming that the power is supplied from power supply equipment utilizing solar batteries and storage batteries, a wide range of operating temperature from − 40 to 70°C, and a maximum operating altitude of 3,000 m. In addition, they must provide high reliability for the stable operation of facilities and the ability to handle field digital communication for improving maintainability. In response to these demands, FCN-RTN provides the following features. FCN-RTU, combining the power supply, base, and CPU modules, consumes only 2.9 W even when the computing function in the main MPU and the embedded I/O function are running and communication interfaces are operating. This power consumption is up to 75% lower than our existing product FCN. Because the power supply equipment in the site, whose power is supplied from solar batteries and storage batteries, is unstable, FCN-RTU can handle a wide range of input voltage of 10 to 30 V DC, and runs with low power consumption. To achieve a wide range of operating temperature from -40 to +70°C, FCN-RTU has been designed to handle a wide range of temperatures from the design phase of parts selection. To allow operation at an altitude of 3,000 m, the amount of heat generated inside FCN-RTU has been decreased. Thus, it can run in a low air density and low heat dissipation environment such as at high altitude. The power conversion efficiency of the power module has been improved to 80% or higher throughout the operating temperature range. This suppresses the inner temperature rise, and allows operation in a high temperature environment without output power derating. For stable long-term operation of FCN-RTU, the CPU module has an error-detecting function for the internal memories and diagnostic functions for the hardware. As a controller for oil and gas mining sites, FCN-RTU is the world's first device to acquire host profile registration for FOUNDATION fieldbus TM H1. Field digital communication with field devices is possible, and thus FCN-RTU can obtain process values and device maintenance data from the field devices. As shown in Figure 2, the CPU module contains a main MPU, memory controller, Ethernet controller, and memories. The memories include the main memory (SDRAM), memory for storing system software program (FLASH), and memory with battery-backup for data (SRAM). For communication with upper systems, both an Ethernet port and serial port are equipped, and can be selected. Power consumption has been reduced by hardware implementation: the adoption of low-power-consumption parts manufactured through state-of-the-art semiconductor manufacturing processes for the main MPU; and the reduction in the number of parts by implementing I/O functions on the memory controller using an I/O MPU for controlling built-in analog and digital input/output functions. Power consumption has been further reduced by software implementation: providing a transition to low-power- consumption mode during idle by using the power-saving function of the main MPU; and turning off the power to peripheral devices such as the serial communication port when not operating. For Ethernet communication which usually consumes a lot of power, power consumption has been reduced by both hardware and software implementation. On the hardware side, there is a switch to turn on or off the operation of the Ethernet controller: turning this switch off cuts the power to it, thus reducing the power consumption. On the software side, an interface to control Ethernet power-saving operation, similar to the hardware switch above, is provided in the IEC61131-3 function block for control application. 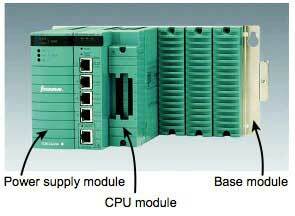 This enables control applications to control the power-saving operation. Users can turn the function off when Ethernet communication is not performed, thus reducing unnecessary power consumption. 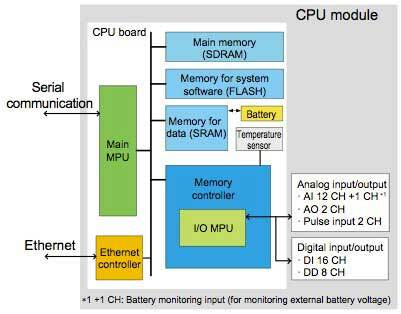 Control programs, data for control, and information for important functions for control operation are stored in the SDRAM and SRAM mounted on the CPU module. The MPU accesses these memories via the memory controller. A delay time is added to the memory access cycle of the MPU, and an ECC circuit for the memory is implemented in the memory controller in addition to the memory interface function. The ECC function is the world's first exclusive function for low- power-consumption controllers used in oil and gas mining sites. When the MPU writes data to the memory, the ECC circuit generates check bits from the writing data and writes the data and check bits to the memory. When reading data, the memory controller receives the data and its check bits, and then the ECC circuit executes the error check. If a 1-bit error is detected, the memory controller corrects the data and then transfers it to the MPU. If a 2-bit error is detected, its error is informed to the MPU. This function enables stable long-term operation for widely distributed equipment and ensures higher reliability compared to the products of competitors' systems. The CPU module features RAS (Reliability, Availability, Serviceability) functions such as CPU self-diagnosis, built-in I/O diagnosis, a watchdog timer, and temperature monitoring. These functions contribute to higher reliability by monitoring the status during start-up and regular operation of the controller. For the CPU module of FCN-RTU which is used under unstable environments of power and communication infrastructure, it is required to keep the collected data in the file system of the CPU module itself for a long time. Thus, the important data must be protected from power failure caused by blackouts and so forth. To improve data reliability, the file system is implemented in flash memory and so is not affected by sudden shutdown. This prevents the loss of data in the file system due to a power failure caused by blackouts and so forth. The architecture of the CPU module of FCN-RTU has complete compatibility with that of FCN. The software structure is shown in Figure 3. The engineering environment for the CPU module of FCN-RTU is the same as that of FCN, and thus the resources of applications configured for FCN can be used as it is. The controller of STARDOM provides the following two application execution environments. These applications are downloaded in intermediate code format, independent of the architecture of the CPU module, to the application layer of the CPU module of FCN-RTU. Applications conforming to the IEC 61131-3 international standard. Applications that cannot be implemented by the control logic configuration tool, such as Web applications, can be configured. Application portfolios (APPF), such as our InfoWell and InfoEnergy, also run on this execution environment. Each application downloaded from the engineering environment runs on the execution engine in the middleware layer. The execution engine compiles the CPU module architecture-independent intermediate codes to the appropriate codes for the own CPU by using the Just-In-Time (JIT) compiler, and then executes them. 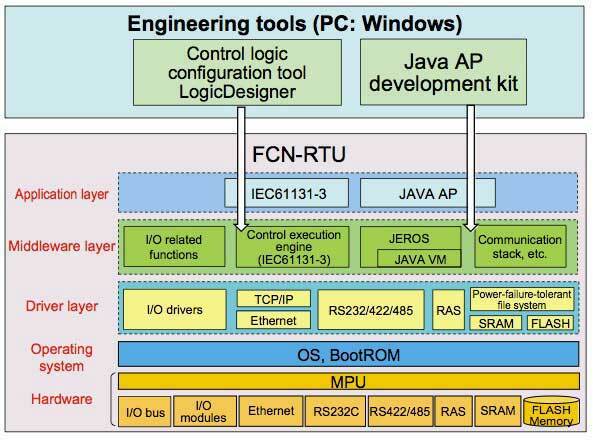 This mechanism makes the engineering tool architecture-independent, enabling the tool to be shared with that for the CPU modules of FCN, and offers a high-speed execution environment. The hardware-dependent functions are resolved by the OS and driver layers, and the common interfaces with the middleware layer are provided for the FCN and FCN-RTU CPU modules. As for the CPU module of FCN-RTU, the functions for reducing power consumption and improving reliability are implemented in this layer. Figure 4 shows an application example of remote control and monitoring of facilities in an oil or gas field using FCN- RTU. In an oil or gas mining complex, as many as 1,000 wells are scattered over a wide area in various places such as on flatlands, highlands in mountainous regions, and high-latitude cold lands. At these mining sites, power supply facilities utilizing solar power and storage batteries are used to operate controllers, flowmeters, control valves, and other devices. The control program is implemented in FCN- RTU installed at each wellhead, and can execute control independently without the upper system, controlling several wells autonomously with a single FCN-RTU. It can also perform temperature and pressure compensation calculation for gas flowrate as well as control of facilities. Each FCN-RTU is connected to a remote central monitoring room or others via public lines. The upper system performs operation and monitoring of the process using our FAST/TOOLS developed as a supervisory control and data acquisition (SCADA) software package. FAST/TOOLS supports more than one million I/O points, well-suited for operation and monitoring of widely scattered devices. By utilizing a FOUNDATION fieldbus communication module inserted in an expansion I/O slot, FCN-RTU can digitize all process data values on site and transmit the results of diagnosis in field devices along with process data through digital communication. Conventionally, users have faced many problems such as time-consuming visits to the sites for maintenance with dangers on the way, and inability to prepare spare parts, etc. in advance because of the limitation that the required information can be obtained only at the site. As FCN- RTU can manage information of multiple devices at the sites collectively and allows users to obtain this information before visiting the site for maintenance, the efficiency of maintenance and users' safety are improved. The newly developed FCN-RTU autonomous controller meets the needs in the energy resources mining industry which is growing in overseas markets. In particular, it achieves high reliability and provides field digital communications capability not provided by any competitors. Utilizing those features, we aim to assist stable energy resources mining in order to satisfy the increasing energy demand in emerging countries. InfoWell, InfoEnergy, and FAST/TOOLS are trademarks or registered trademarks of Yokogawa Electric Corporation. FOUNDATION fieldbus and Ethernet are registered trademarks of the Fieldbus Foundation™ and Xerox Corporation, respectively. Other product and company names appearing in this article are trademarks or registered trademarks of their respective holders.